Gather all the components of a powerful Dwarven Crown from within a forgotten Dwarven ruin. Enter the Vardnknd Gallery section of Runoff Caverns and retrieve the Dwarven Crown from Elberon's body. Locate the Dwarven Autumn Visage in a side room the Autumn's Bells section of the dungeon. Locate the Dwarven Spring Visage down a long side passage in the Spring's Symphony section of the dungeon. Locate the Dwarven Winter Visage in a hidden area in the Winter's Chimes area of the dungeon, accessible by means of a sloping pipe. Unlike most quests added by Creation Club, this one does not automatically begin upon installing Forgotten Seasons. Instead, you must travel to Vardnknd Gallery, the second section of Runoff Caverns, a dungeon which will already be marked on your map. Once you enter this section of the dungeon, a wizard named Elberon will be struck by lightning, dying instantly. This quest will then begin, prompting you to loot Elberon's corpse for his strange Dwarven Crown. Once you've obtained the Crown, you will be prompted to search for three masks which can be slotted into the headpiece. All three of these can be found within the dungeon in their corresponding areas, although they are designed to be well-hidden and therefore may take a bit of exploration to find. The Dwarven Spring Visage is located in the Spring's Symphony section of Runoff Caverns. It is located at the end of a long side hallway containing an elk. The hallway is partially filled with a green miasma, so the Dwarven Drone Fly you obtain elsewhere in this section might prove useful. The Dwarven Winter Visage is found in the Winter's Chimes section of Runoff Caverns, in a hidden area that can be challenging to find. 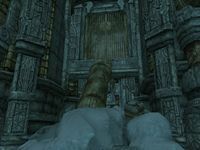 It is located off the short hallway containing the ice wraiths, through a Dwarven gate that is raised above ground level. The gate must be reached by climbing up a bank of snow and a sloped Dwarven pipe (as pictured above). Once you have navigated to the chamber containing the Visage, you will be attacked by a powerful Frosted Dwarven Centurion which will attack you with frost attacks. Once you have gathered all four items, this quest will end. You can bring the Crown and Visages to any forge or anvil and affix a Visage of your choice to the Crown by using two leather strips. This will allow you to create the Dwarven Crown of Autumn, Dwarven Crown of Spring, and Dwarven Crown of Winter, and switch them out at will. These modified versions allow you to combine the powerful enchantments on the Visages with the armor protection of the Crown. This page was last modified on 14 March 2019, at 23:58.